« Hall Of Fame Game Meet Up! How Worried Should We Be About The Offensive Line? Are you guys as terrified as I am about our offensive line? 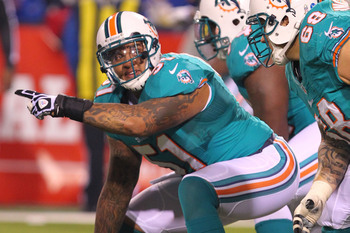 Mike Pouncey is one of the best linemen in the NFL and Richie Incognito is the man. I feel like Tyson Clabo will hold is own but the rest of the line frightens me. With the mediocre John Jerry injured the team seems to be in panic mode trying out a bunch of different linemen in different spots. 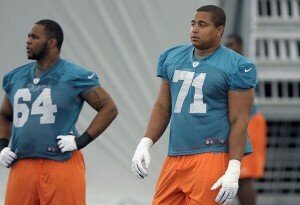 Pouncey can play guard, he did in college, but why would you move one of the best centers in the world? Last years undrafted free agent Josh Samuda is getting a lot of reps all over the line and rookie G Dallas Thomas is seeing a lot of first team snaps. Lance Louis is gimpy and Nate Garner is a great versatile back up but I don’t want him starting any time soon. With all this interior line transition the tackles seem fixed and the most worrisome bit about all this is that Jonathan Martin is our starting left tackle. We are trusting the most important position on the line to a second year player who was absolutely horrible last year. He was playing out of position on the right side but when Jake Long got hurt he didn’t do much better on the left going up against better talent. I don’t needÂ to quote statistics and Martin seems in better shape than last year, but every camp report talks about how dominant our defensive line is and how many sacks they are getting. You have to think that part of it is how terrible our offensive line is. During the scrimmage the defense beat the hell out of the offense, but we have a great defensive line so maybe that’s expected and we hope they will look better against other teams. Unfortunately the Hall of Fame Game won’t show us much because Dallas has a one of the best defensive lines in the league. (Speaking of lines if you are curious about how sportsbooks are considering these early match-ups may want to refer toÂ NFL linesÂ on the matter. )Â The second preseason game is when I really hope the line comes together. 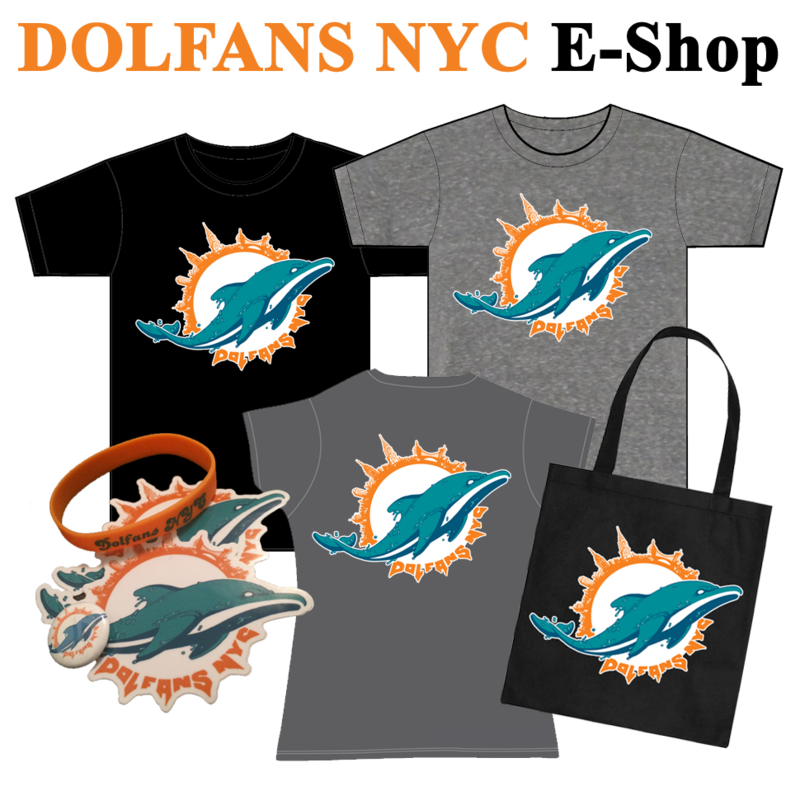 The Dolphins need to find a line up and stick to it and let the guys on the line gel. Other than a QB and his receivers the offensive line is the position where chemistry is most important. These guys need to know what it’s like playing next to each other and if Mike Pouncey ends up playing guard somehow none of the guys will have been next to each other last year. As I type this Dion Jordan blew right past Jonathan Martin in practice and Twitter exploded with beat writers talkingÂ about how bad Martin is. I just really hope he can get it together and we don’t regret not resigning Jake Long or trading for a veteran offensive tackle. Are you guys as worried as I am about the offensive line or is it way too early to panic. Let me know in the comments. And don’t forget our Hall of Fame Game meet up on Sunday! This entry was posted on Wednesday, July 31st, 2013 at 9:08 pm	and is filed under Dolphins News. You can follow any responses to this entry through the RSS 2.0 feed. Both comments and pings are currently closed. It’s early in camp – the team is obviously relying on the defense to keep the team in the game while the offense grinds out early season growing pains. Although the line has concerns, they are solid enough to keep us in games and win more than 7 games last year. We seem hit by an injury bug – which concerns me more than anything right now. People get hurt every year, it’s about how you manage with those injuries. It doesn’t seem like Hartline or Wallace are hurt badly but obviously if either of them are down for real games we could be in trouble.